Government is considering amending the Constitution to remove a clause, that makes the post of Vice President(s) elective, which is set to come into effect in the next harmonised elections in 2023. The 2013 Constitution, through Section 92, has a 10-year transitional clause that provides for the joint election of the President and two running mates selected by the Presidential candidate. However, bureaucrats working on an omnibus Constitutional Amendment Bill that is expected to refine the country’s supreme law say they will open debate on the usefulness of the clause, which Constitutional experts say is an “America concept” that can potentially precipitate a political crisis by creating two centres of power. Justice, Legal and Parliamentary Affairs Minister Ziyambi Ziyambi, who chairs the Inter-Ministerial Taskforce that was recently established to work on wide-ranging proposed amendments, said there was need to deeply reflect on this impending provision. “We need to initiate debate on it; we need to ask ourselves whether we need such a provision,” said Minister Ziyambi. “We are looking at and engaging the public and debating about whether it is necessary; but in my opinion, I do not think it is necessary. “You do not want to create two centres of power; that is something we need to avoid at all costs. “Naturally, the head of the executive is the President; what then does it mean when we have three people who are elected by the masses into the executive, who will wield more power? “It is another issue that needs debate, and I think we need to take it out,” he said. The clause, outlined in Section 92 of the Constitution, stipulates that the election of a President and Vice Presidents must take place concurrently with every general election of Members of Parliament, provincial councils and local authorities. It reads: “(1)The election of a President and two Vice Presidents must take place within the period specified in section 158,” reads Section 92. “(2) Every candidate for election as President must nominate two persons to stand for election jointly with him or her as Vice Presidents, and must designate one of those persons as his or her candidate for first Vice President and the other as his or her candidate for second Vice President. In the event of a sitting President’s death, resignation or removal, the first Vice President will assume office until the expiry of the former President’s term. Constitutional law expert and University of Zimbabwe law lecturer Professor Lovemore Madhuku said the provision was “not an idea that came from the people”. “That is an American concept which has only applied in the United States and has been followed by very few other countries,” said Prof Madhuku. “Otherwise the general trend is that you elect the President and the President must then have the leeway to constitute his executive through appointing his deputy and his ministers; that prerogative must be that of the President who is elected. “The second thing is that that provision which is in the current Constitution never came from anyone, it was creation of Copac, it never came out of the public hearings. “That is the problem with having a Constitution that is drafted by the elites,” he said. Copac was a constitution parliamentary select committee that was set up to draft a new Constitution before 2013. Professor Madhuka said the clause, which he described as “a terrible provision”, is potentially destabilising. However, Copac co-chair and Zanu-PF lead negotiator during the constitution-making process Paul Mangwana said the provision was meant to bring certainty to the succession issue. “The logic behind that clause was to bring about certainty around the issue of succession of a head of state,” he said. “In the event of failure by an incumbent to finish his term, then everyone would know who was next in line to finish the term. The omnibus Constitutional Amendment Bill that is currently in the works is expected to deepen civil liberties, individual rights, scrap the death penalty, extend the women’s quota system and entrench political and electoral reforms. It is also primed to perfect the local systems of governance. The high-level team will also fast-track legislation will enhance the ease of doing business and repeal laws that are inconsistent with the Constitution or previous court judges. 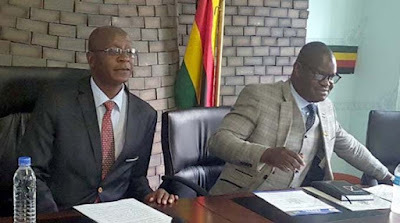 Minister Ziyambi is deputised by Foreign Affairs and International Trade Minister Dr Sibusiso Moyo.